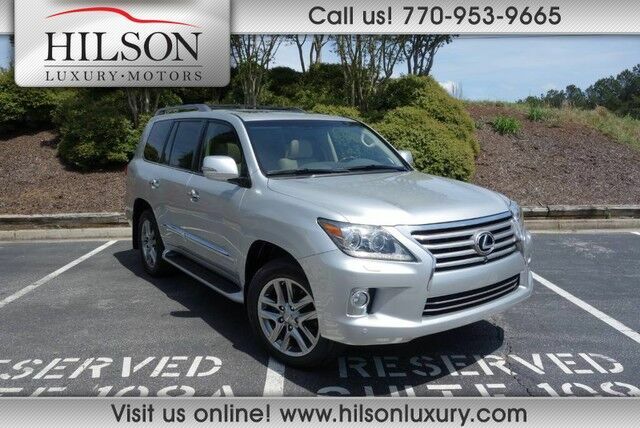 LIKE NEW LUXURY PACKAGE LX570! 1-OWNER SOUTHERN OWNED LX570! AWD..5.7L V8..MARK LEVINSON SOUND W/NAVIGATION AND 360 DEGREE CAMERA..KEYLESS ENTRY/START..HEATED/COOLED FRONT SEATS..HEATED STEERING WHEEL..REAR HEATED SEATS..FACTORY REAR DVD ENTERTAINMENT..REAR AIR AND AUDIO..POWER FOLDING 3RD ROW SEATING..POWER CLOSING TAILGATE..POWER SUNROOF..POWER SLIDING REAR SEAT..PARK ASSIST..LED RUNNING LIGHTS AND XENON HEADLIGHTS..FACTORY REMOTE START..WOODGRAIN STEERING WHEEL AND TRIM THROUGHOUT..MEMORY SEATS..BLUETOOTH INTEGRATION..AUX AUDIO INTEGRATION..CD PLAYER..POWER EVERYTHING..ROOF RACK..STEP BARS.. 4X4 CRAWL CONTROL..SELF LEVELING ADJUSTABLE SUSPENSION..20" FACTORY WHEELS W/EXCELLENT CONDITION CONTINENTAL TIRES..TOW PACKAGE..NON-SMOKERS VEHICLE! FLAWLESS MERCURY METALLIC EXTERIOR WITH LIKE NEW TAN LEATHER INTERIOR. THIS LX570 HAS BEEN MECHANICALLY INSPECTED AND SERVICED UPON ITS ARRIVAL. THE CARFAX CAN BE VIEWED FOR FREE BY CLICKING ON THE CARFAX ICON ON OUR LISTINGS.THIS LX570 IS IN EXCELLENT CONDITION INSIDE AND OUT! IT HAS BEEN VERY WELL CARED FOR AND IT SHOWS! THIS IS NOT YOUR TYPICAL NEW CAR DEALERS TRADE IN OR PRIVATE SELLERS VEHICLE. IT HAS BEEN FULLY RECONDITIONED AND NEEDS NOTHING! YOU WILL NOT FIND A NICER LX570 ON THE MARKET! ALL OF OUR INVENTORY AT HILSON MOTORS IS AUTOCHECK/CARFAX CERTIFIED..SAVE SOME TIME AND VISIT US FIRST FOR A HIGH QUALITY VEHICLE AT A VERY REASONABLE PRICE!! HERE AT HILSON MOTORS WE ARE A NO HAGGLE NO PRESSURE OWNER OPERATED SMALL BUSINESS THAT STRIVES FOR QUALITY INVENTORY AND EXCEPTIONAL CUSTOMER SERVICE..HILSON LUXURY MOTORS IS BBB ACCREDITED AND ENCOURAGES YOU TO CHECK OUR ONLINE REPUTATION..COME SEE THIS LX570 IN OUR 6000 SQFT INDOOR SHOWROOM RAIN OR SHINE..WE OFFER COMPETITIVE FINANCING RATES AND A RANGE OF EXTENDED WARRANTY/GAP PROTECTION PROGRAMS..WE GLADLY ACCEPT TRADE INS!! PLEASE CALL WITH ANY QUESTIONS 770-953-9665..